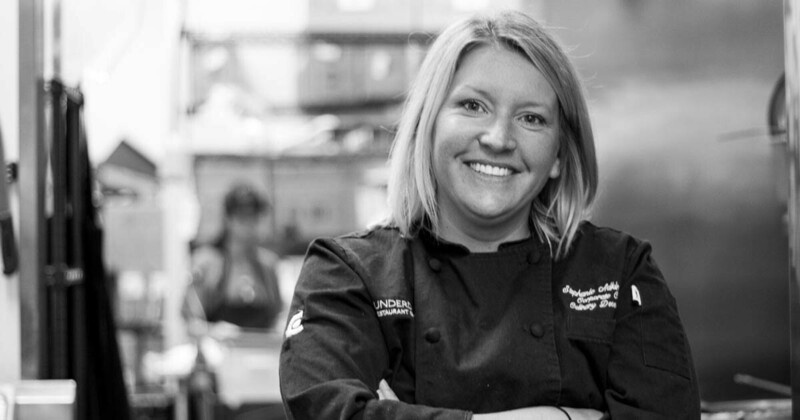 As a chef with young children, Adkins shares her secrets on getting the whole family involved in the kitchen. By day, Stephanie Adkins works as a corporate chef in charge of menu development and recipes for Thunderdome Restaurant Group—the juggernaut behind beloved Cincinnati restaurants Maplewood Kitchen, The Eagle, Bakersfield, and more—but with two kids, she’s no stranger to whipping up home-cooked meals on weeknights. Passing on practical nutrition and cooking knowledge to her children, ages 4 and 12, she imparts the importance of preparing healthy meals by getting the whole family in on the process. The kitchen is a space for them to experiment and be creative, and she has a few tips for parents to help broaden their children’s horizons and get them excited about participating. How do you encourage your kids to cook and eat new things? There’s about eight years between them, so they fall on both ends of the spectrum. My oldest has always been easy. He will literally eat anything. With my younger one, I have to be more creative. Taking him to the grocery store has made a huge difference. Having him involved in picking out produce and talking about fruits and vegetables has really changed his perspective. Now he wants to be part of it, and it has changed the way he eats. He asks a lot of questions like, “What is this?” or “Can I eat this?” You know, typical 4-year-old questions. I think involving kids in the decision-making is important. I usually ask my sons, “What do you guys want for dinner this week?” And although I’m a chef, I still cook dinner at home every night. As busy as you are, it’s important for the kids. They like to be involved. What tips or ideas do you have for other parents who want to get their families more involved in the kitchen? Kids should be involved in the entire process, from deciding what to make to shopping to being part of the cooking and preparation. Being a chef, I am more comfortable teaching my kids. My little one can hold a knife and cut. Have them participate to their comfort level, whether it’s washing vegetables, stirring, snapping beans—as long as they’re part of it. Having patience with them is important, too. I usually try to pick tasks that I know each of them are capable of doing. I’m actually surprised that they’re as interested as they are. What foods do you find parents order most often for their kids at Maplewood Kitchen, and what do your kids ask for when they visit? Most of the parents are ordering off of the kids menu for their kids. The best-selling item is the pancakes at both Maplewood locations (downtown and Deerfield Towne Center). Even for my kids, when we go, they get the pancakes. The grilled cheese is also popular. For the most part, our business lunch crowd comes to Maplewood for the healthier aspect. But when families go to Maplewood for Sunday brunch or for dinner, they’re going for a celebration. In that type of environment, parents aren’t as honed in on the really healthy options, like quinoa cakes or power bowls. They are more open to their kids eating pancakes for dinner. What meals do you tend to cook at home with your kids? I typically cook comfort food with a twist. Two nights ago we made salmon cakes, and my little one helped break up the salmon. Last night we made spaghetti squash and meatballs. They took part in spiralizing the squash. Right now my younger one is more interested, but when the older one was at that age, he was more interested, too. What recipe would you like to share with local parents who want to get their kids involved? This is a breakfast bake incorporating Laura’s Lean 92% Ground Beef. I picked something that is easy to make with kids, but it’s also an item that mom and dad can enjoy without feeling guilty. It is paleo, gluten-free, and Whole 30-friendly, so it’s hitting the adults who are health conscious and aware of these lifestyle choices. This wholesome brunch—gluten-free, paleo, and Whole 30-friendly—is a crowd-pleaser for kids and grown-ups alike, combining Laura’s Lean 92% Ground Beef, bacon, crispy sweet potatoes, spinach, and baked eggs. 2. Toss sweet potatoes with the 2 tsp. olive oil and sprinkle with salt and pepper, then arrange in a single layer on a cookie sheet and roast for 35 minutes. 3. Heat a large, oven-proof or cast-iron skillet over medium–high heat. Add bacon pieces and cook until just under done. 4. Add the onions to the bacon and continue to cook until the onions are translucent. Add crumbled Laura’s Lean 92% Ground Beef, mushrooms, sea salt, and pepper, and continue cooking, stirring until the mushrooms soften and the beef browns. 5. Stir in spinach and remove from heat. Add the roasted sweet potatoes and gently toss to combine. 6. Lower the oven heat to 400 degrees. Use a spoon to create four small grooves in the mixture, and then carefully crack each egg into a groove. Season with more salt and pepper, then bake for 10–15 minutes. 7. Finish by garnishing with chives before serving. Pro tip: Save time by making ahead. Cook everything except for the eggs, then before serving, add eggs and bake until cooked through.